This book is an outgrowth of my Perimeter Defense Rifle course, which looks at using a rifle in defense of life beyond what is normally considered handgun range. Most defensive rifle courses focus on “close quarters battle” (CQB), or using the rifle as a defensive tool inside the home, in what we would normally consider handgun range. Those of us who live outside of suburbia, on acreage, understand that the defensive problems in using a rifle go much deeper, beyond the CQB fixation of the military- or law enforcement-inspired rifle courses you usually find. Distances are greater; instead of dealing with an intruder across the room, you might be dealing with a predator across the yard — or across the field. The targets are often smaller; predatory animals are a distinct threat you might face. When an emergency happens, your rifle isn’t likely to be close at hand (let alone all ‘slung up’ and ready for immediate employment). You’ll need to go to where it’s stored, retrieve it, then take it to where you can effectively use it against the threat. This raises all kinds of issues, from how the gun is stored or staged to how you move with it, often through rooms, doors, and gates. When you finally get to the point where it can be employed, the shooting problems need to be addressed: how do you get accurate first-round hits at distance, and how do you keep on target if multiple rounds are needed? Protecting Your Homestead covers these topics and a lot more. In this book you’ll learn how to pick the right rifle for the job of perimeter defense; the best and most flexible calibers; how to zero your rifle* (and why it’s important); choosing and using sights and optics; shooting positions from fastest to most stable; how to properly store, retrieve and move with your rifle to the threat; how to get to your first shot more quickly and accurately; and much more. 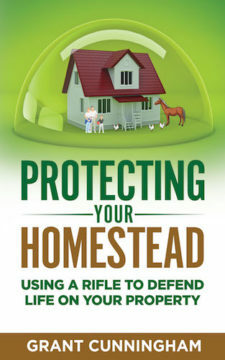 If you live in the country (or hope to) and own a rifle for self defense, this book is your best guide to using it responsibly and effectively to protect yourself, your family, and life on your homestead! * — In fact, the chapter on zeroing your rifle is the one I’m most proud of. It covers the topic in a way that you won’t see anywhere else, with simple explanations and innovative illustrations. One of my proofreaders told me he thought that chapter alone was worth the price of the book!